No more searching for a pen or pencil. This handcrafted leather holder fits snugly around the spine of a hardcover notebook, keeping your writing instrument where you need it. 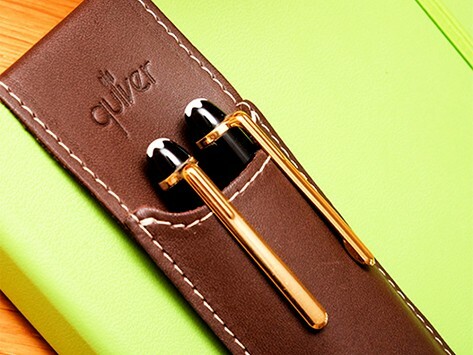 Quiver works just as well with a small tablet case, too, so you don’t have to worry about losing an expensive stylus. The natural leather is durable and develops even more character as it ages. Dimensions: 8.25" x 2.25" x 0.5"
So wonderful not to have to look for a pen each time I open my journal. Absolutely love this pen holder! Fits on the tablet very nicely. Great idea! Use it always! Plan to give as affordable, practical yet classy gift to business associates. The search is over. 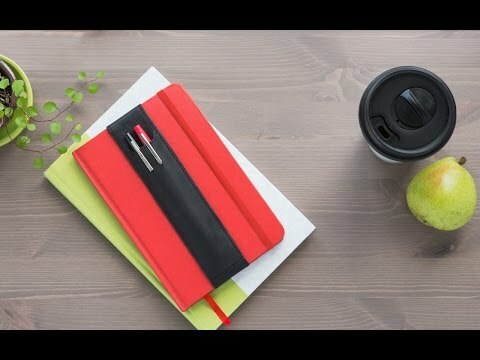 Your pen (or pencil, or stylus) will always be right where you left it.